Top row (left to right): 1. Brenda Taylor, 2. Patricia Willyard, 3. Janet Volkman, 4. Ricky Stallbaumer?, 5. Lori Neely, 6. Steve Taylor, 7. Sandy Nelson, 8. Wade Thompson, 9. unidentified. Second row: 1. Patricia Schimmelfenning, 2. Doug Miller, 3. Barbara Shirley, 4. Brian Odell, 5. Denise Neely, 6. Brian Pendly, 7. Lori or Laurie Roszell, 8. Jody Moniz, 9. Stacy Reno. Third row: 1. Denise Moore, 2. Ken Fordyce, 3. unidentified, 4. Rodney "Bunky" Turner, 5. Joe Paulo, 6. Leslie Watson, 7. Brian Rotsten, 8. Laura Wisely, 9. Steve Sinchak. Fourth row: 1. Mr. Williams, 2. Mrs. Clarin, 3. Mrs. Wigler, 4. Mrs. Baim, 5. Steve Tracy, 6. Ann Newcomb, 7. Jeffrey Richards?, 8. Laura Winter, 9. Mr. Bosworth. Credits: Scanned and submitted by Brian Rotsten. Thanks to Brenda Taylor, David Booth, Jess Guymon, and Sandy Nelson for identifying the kids in this picture. The kids in the picture are members of the high school graduation class of 1977. To find other pictures of the class of 1977 in the archive, see Livermore class pictures listed by year of high school graduation: 1977. And if you have any pictures of the class of 1977 that you would like to share, please submit them to the Archive. 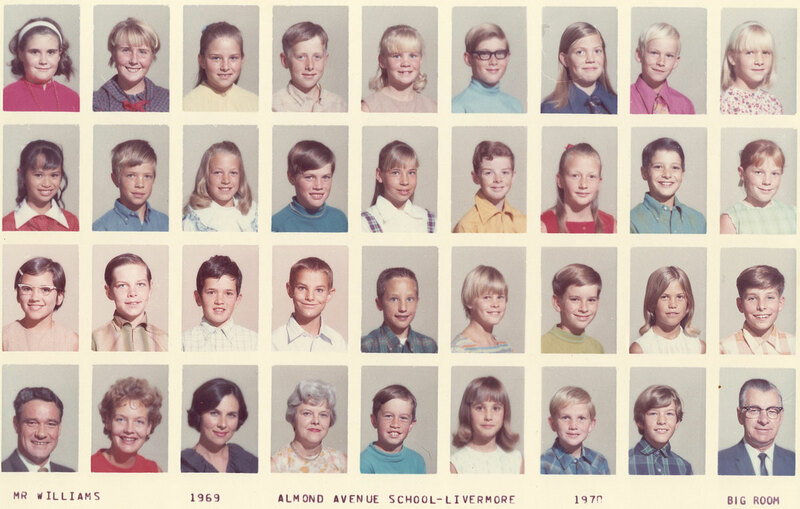 To find other pictures from Almond Avenue School in the archive, see Livermore class pictures listed by school: Almond Avenue School. And if you have any pictures from Almond Avenue School that you would like to share, please submit them to the Archive.